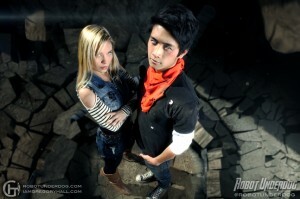 A few weeks ago we saw an amazing live action Android 18 portrayed by Amy Johnston in the upcoming live action Dragon Ball Z movie by Robot Underdog. Robot Underdog have kept the project secret while still teasing fans with a few pictures. It’s easily the most exciting Dragon Ball project of the decade outside of the recent Battle of Gods movie. The latest teaser comes as a picture of Android 17 and 18 from the movie. After seing a few of Amy’s stunt videos its obvoious they are serious about making an epic Dragon Ball Z movie.